Country Care Pet Hospital offers state of the art laser technology, including laser surgery and laser therapy. The surgical laser has revolutionized many surgical procedures and has made possible many more. Less pain - The laser beam seals nerve endings and blood vessels as it cuts through tissue, resulting in less pain for your pet. Less chance of infection - The laser requires no contact with the patient, and kills bacteria in its path. Less bleeding - The laser scalpel seals blood vessels as it opens the tissue during the surgery, resulting in better visibility and shorter procedures. Swelling reduction - The laser does not crush, tear, or bruise tissue, causing less swelling and discomfort. Greater precision - The laser scalpel can remove unhealthy tissue while leaving the surrounding tissue intact. Faster recovery times - All this adds up to allow your pet a faster and more comfortable return to health and activity. For more in-depth information about our laser surgery and services please ask a member of our staff, or follow this link to our manufacturer's web site. Laser Therapy is a non-invasive, clinically proven treatment that helps reduce pain and inflammation, resulting in faster healing and recovery from surgery. It works by sending photons deep into the targeted tissue, stimulating cells to repair themselves faster. Laser therapy can be used to treat post surgical wounds, help fractures heal, treat osteoarthritis, and has many other applications. Laser Lacey was a kitten that came to our shelter friends at Helping PAWS Pet Rescue. Due to a birth defect, Lacey had a deformed rear leg that developed a sore from the contact it made to the ground. 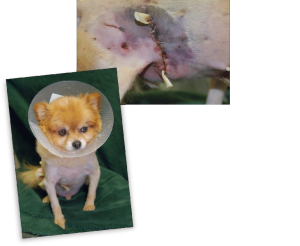 Laser therapy helped to heal the wound, and when further complications required the removal of the leg, laser therapy was used again to heal the incision, and reduce inflammation. In addition, it helped to sooth her other hip joint, which was strained from the extra stress placed on it. Lacey has since been adopted, and lives a healthy, pain-free life. For more information about laser therapy, visit the Companion Therapy Laser website. 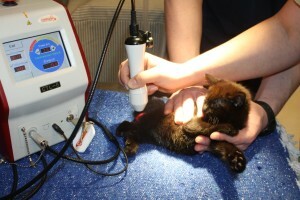 Country Care Pet Hospital utilizes Companion Laser Therapy for treatment of many ailments. rounds unencumbered by a leash. Dog owner Selda King of Stuarts Draft, Va., let Benji out one morning, regrettably unleashed. Benji came home with huge gaping wounds, the victim of an attack by another dog. 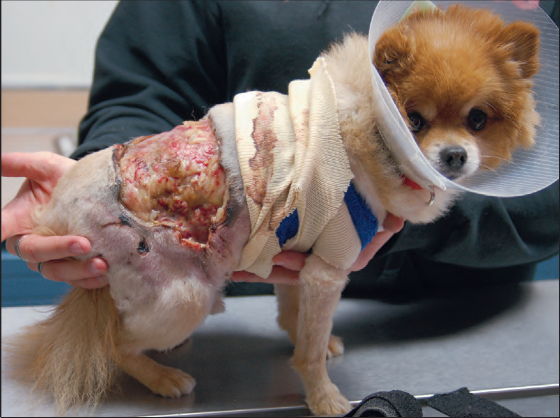 After assessing his extensive soft-tissue injuries and loss of skin, emergency veterinarians didn’t give the little dog much hope of recovery. They recommended euthanasia. King refused to accept that recommendation and persuaded David Parker, DVM, at her usual veterinary clinic, Clair Park Animal Hospital, to perform surgery to close Benji’s wounds. Dr. Parker tried to stitch up three large wounds but the skin kept falling away. A life-threatening second surgery attempted to minimize the size of the wound. Clair Park veterinary technicians visited Benji at home to change his dressings every day, hoping for the best. While they waited to see how Benji would recover, King’s friends and neighbors set about collecting money to pay for the expensive surgery and medications as well as the extensive treatment that would be required while the little dog healed. The Mosby Foundation, after a fundraiser and public pleas for help, underwrote a significant portion of Benji’s veterinary care. The nonprofit charitable foundation is nationally recognized for caring for dogs in need, including those who have been injured or abused. During the fundraising efforts, Terri Sears, DVM, of TenderCare Veterinary Center of Fishersville, Va., learned of Benji’s plight. Dr. Sears had just purchased a Class IV Companion Therapy Laser for her practice. 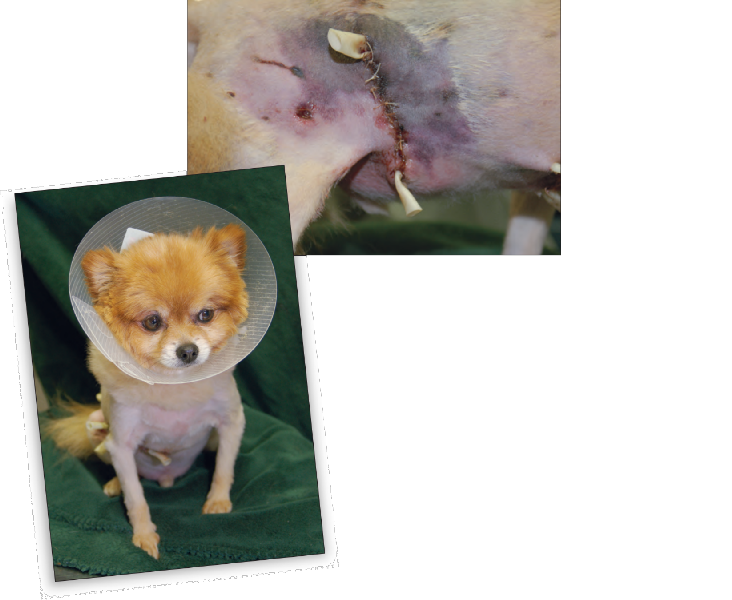 She offered to give Benji free laser treatments to facilitate wound closure. Sears said the invisible light beam puts laser energy into the cells, causing them to reproduce faster and the wound heals more quickly and with less pain. The laser also dilates vessels at the site, increasing blood flow to the area and reducing swelling. Sears’ notes show that laser treatment was administered to Benji on average once every third day. At first, the wound area was treated with two cycles through the device’s “Contaminated Wound” protocols. The target dose was 3-5 Joules/cm2; 2W/30 sec/20,500, 5,000, 10,000 Hz. As healing progressed, operator-defined protocols delivered 3-5 Joules/cm2. Less than a month later, on March 9, the wound measured 11⁄2 inches across and the top part was closed. She said the wounds showed “rapid healing with faster than expected granulation and successful epithelial migration. Skin grafts were not required. “Normal healing of a wound like this ranges from 0.5-1.0 mm per day,” she said. 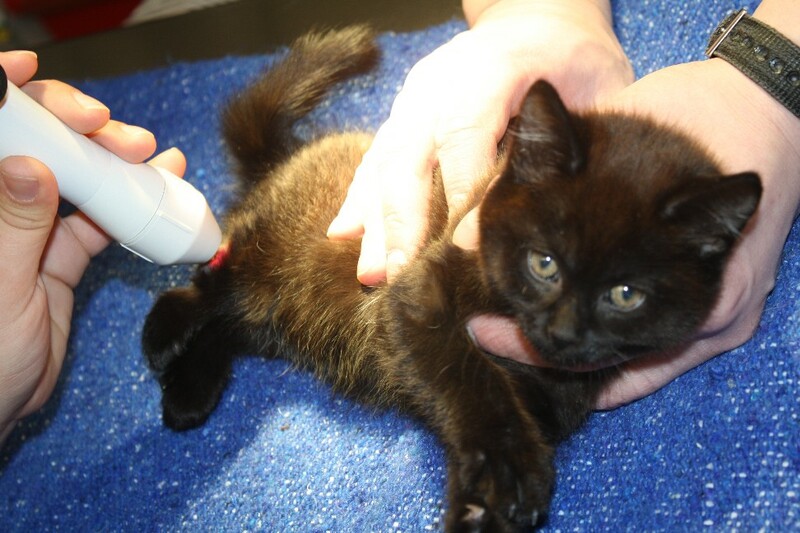 “We have been measuring Benji’s wound and calculated Benji’s healing rate since we started and it is 1.6 mm per day. “If we use an average healing rate of 0.75 mm per day, the laser increased his healing rate by 113 percent,” she said, “more than double [what is expected]. “We are impressed.” Sears said Benji’s new skin “is for the most part supple.” His fur is growing back. She is not seeing much scar tissue, which can sometimes inhibit a dog’s normal movement. Literature studies document an increased rate of fibroblast migration in wound healing with Class IV laser therapy. This case illustrates the benefit of that effect, Sears said. Sears said Benji’s prognosis for a normal life is excellent. She said he is totally healed and back to his normal activities. Because of the reduced wound scarring, he has no movement restriction and no physical limitations. This Education Series story was underwritten by LiteCure LLC of Newark, Del. © 2018 Country Care Pet Hospital. All Rights Reserved.